Times aren’t easy for libraries, not politicians searching for ‘efficiencies’ cutting budgets and making us do ever- more with ever- less. I’m constantly having to point out that the Lighthouse Library, of which I am director, is far more than a place to check out books. We’re a community center. A place for the elderly and the lonely to find companionship, for the down-on-their-luck to access resources, a vitally important resource for developing the love of reading in children (particularly those not fortunate enough to have a reading environment at home), and a treasure-trove of historical documents and maps that anyone can access. Our public events are always hugely popular with locals and visitors alike. An active, participating, involved community is more important than ever in these days of social media and constant attention to computers rather than people. And, bonus, all of our events are FREE. We’re proud of our library, and I’m proud to be its director. Pop in and visit us when you’re next in the area. Everyone is welcome, and we don’t care if you don’t have money to spend! Not going to be in Nags Head anytime soon? Then you can visit us in the pages of the Lighthouse Library series. They have them at your local library! To celebrate Library month, Eva Gates would like to give one lucky reader the chance to make a donation to their favourite library. 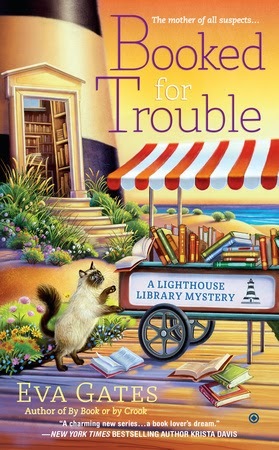 We’ll offer either a large print book or an audio CD of BOOKED FOR TROUBLE, a Lighthouse Library mystery by Eva Gates. Please leave a comment below to enter. Eva Gates is the pen name for National Bestselling author Vicki Delany, who writes the Sherlock Holmes Bookshop mysteries and the Year Round Christmas Series. Hello! 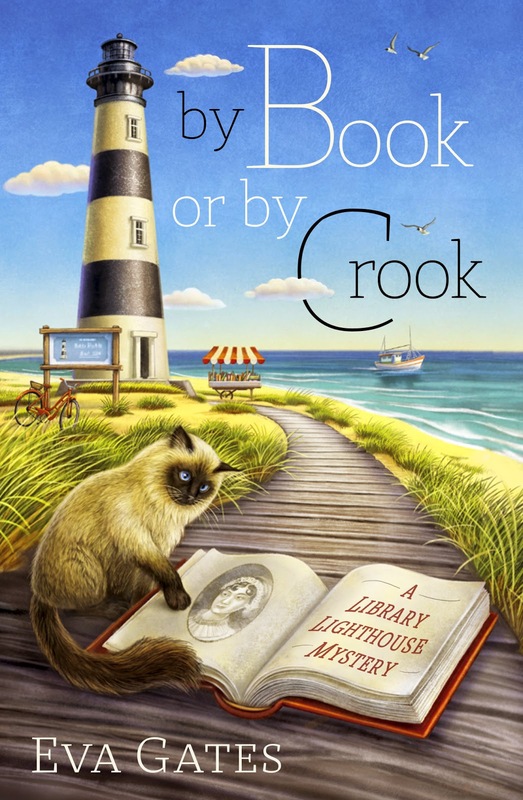 I am finally enjoying "By Book or By Crook"! And I'm reading it quickly (wow for me!) because it's so good! The library where I work (and am on the Book Selection Committee)will be reopening(Yay! ), so I would be thrilled to get either the large print or audiobook. I am definitely a fan and am looking forward to continuing to read your books (love the Year-Round Christmas mysteries too!). I've read the series to date and can't wait for the next one. abeachlifesc at Yahoo dot com. My library has limited buying. They would appreciate a donation. We have a lovely little Library in our small town of Fairplay, Co. we live in the mountains at 10,000 feet and our library has a lot of books for such a small town! Thank you so much for the library giveaway. I now depend on the wonderful librarians at library-by-mail at Glen Burnie MD. My local library is very popular and busy. Since we have a large number of "older" readers, large print or audio books are a great offering. 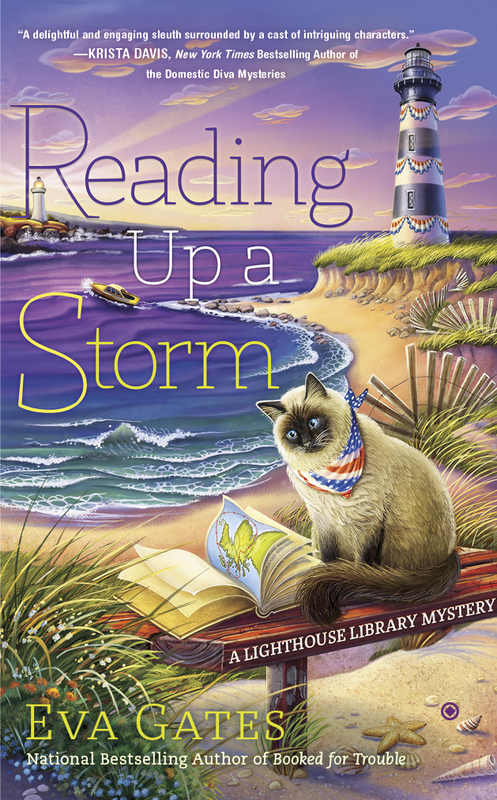 So happy that we have another chance to visit your library in a lighthouse. It’s a fun series. It’s been awhile since my last visit, but I’m sure it won’t take long to renew acquaintances with familiar friends. Tucson library system is large, but any donation,especially of an audiobook would be greatly appreciated by their bookmobile, I’m sure. Thanks for the donation, wherever it goes. Lldawnjm (at) gmail ( dot) com. My super forever best friend is director at a library in York County, Pennsylvania. If I were to win, the book would go to her library which is like the Lighthouse library, it is the Center of its community. Wherever we travel together, we visit libraries! 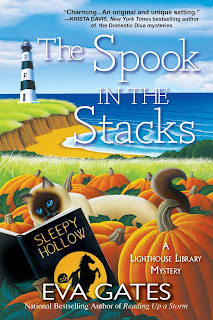 I think we need to visit the Lighthouse Library! Thanks for entering the contest everyone! I'll be in Phoenix this week for Cozy Con at the Poisoned Pen on Saturday (May 3) and at Tempe Public Library on Sunday! Love libraries. Congratulations to Sheryl. You win a large print copy of Booked for Trouble! Thanks everyone for entering the contest.